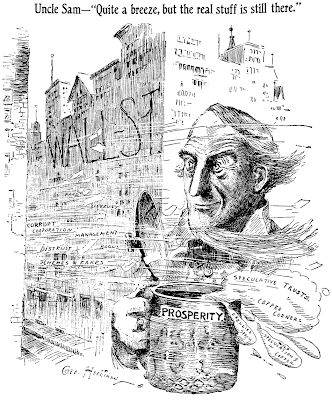 Friday, October 25 1907 — Herriman makes another appearance on the editorial page, this time taking a ‘glass half full’ outlook regarding Wall Street shenanigans. Note the delicately drawn embossing on Uncle Sam’s stein. Hum. I can see today’s wall street using this cartoon to polish their image…but the idea of Uncle Sam quaffing a beer–I don’t know.